Cambridge Gliding Centre was founded as Cambridge University Gliding Club in 1935 and has been at Gransden Lodge Airfield since 1991. Now the premier Gliding Club in East Anglia, we are a not-for-profit organisation and a registered Community Amateur Sports Club dedicated to helping people learn to fly and enjoy the sport of gliding. We have recently received generous support from Sport England to update our launching facilities. Most of the Centre activities are managed and delivered by the members on a voluntary self-help basis, supported by dedicated staff who provide professional gliding instruction and administrative support, especially during the busy summer months. We are open 7 days a week from the beginning of April to the end of September every year, and 5 days a week from October to end March – all subject to suitable weather. Beyond our training and early mentoring capability, Cambridge Gliding Centre is a major centre for cross-country gliding in the UK and has hosted many regional and national gliding competitions. Cambridge Gliding Centre is a member of the British Gliding Association, which is the national body responsible for regulating Gliding in the UK. We have a clubhouse with kitchen and bar as well as accommodation and camping areas. We have a modern fleet of high-performance gliders including four two-seat gliders and five single-seat gliders. 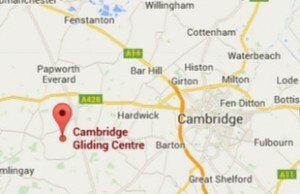 In addition to Club aircraft some 70 gliders are based at Cambridge Gliding Centre that are owned by our members. For a full list of the club facilities click here. Full list of flying fees and other charges. Cambridge Gliding Centre was originally founded as the Cambridge University Gliding Club in 1935. Gransden Lodge Airfield was originally built as a WWII air force base.